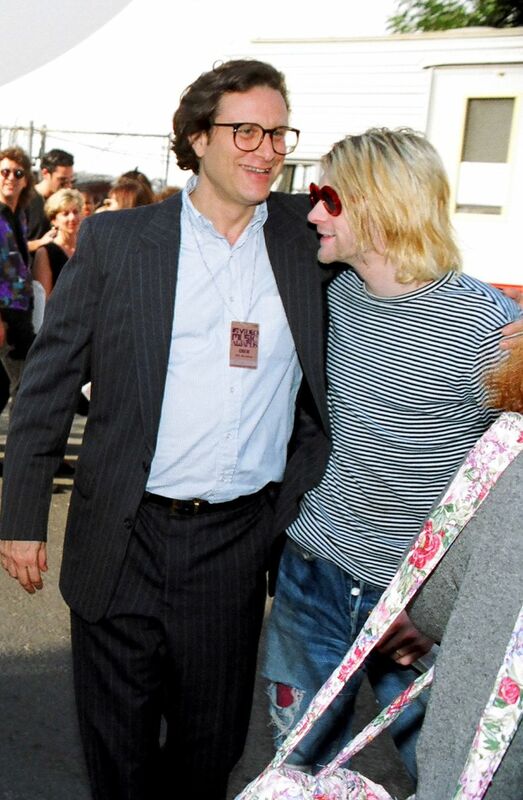 For 10 years after Kurt Cobain’s death, his former manager, Danny Goldberg, couldn’t listen to Nirvana. He couldn’t read any of the many books written about Cobain. What Nirvana’s music meant, or came to mean. None of it. “The wound was too fresh,” Goldberg said from his office in New York, where he is president of the artist-management company Gold Village Entertainment. Over the last decade, though, Goldberg realized that the portrait being painted of Cobain was not so much inaccurate as incomplete. “It was a distorted portrait, more about his death than his life,” Goldberg explained. “One of my favorite artists is Jimi Hendrix. I don’t think about his death, I think about his guitar solos. And I realized that both he and Kurt were very young, and exhibited high-risk behavior. But they also had a similar greatness. That perspective has been captured in Goldberg’s new book, “Serving the Servant: Remembering Kurt Cobain,” released to coincide with the 25th anniversary of Cobain’s death. It’s a first-person account of Goldberg’s relationship with Cobain and Nirvana, and their accelerated trip through the funhouse of fame, the music business, and all the pressures that came with it. Goldberg will talk about the book with Cobain biographer Charles R. Cross (“Heavier Than Heaven” and “Here We Are Now: The Lasting Impact of Kurt Cobain”) and longtime Seattle deejay Marco Collins, an early supporter and friend of the band, at 7 p.m. Thursday, April 18, at the Neptune Theatre. Tickets are $36.50 and include a copy of the book. Goldberg met Cobain in 1990, when Nirvana was shopping for a manager who could make things happen — namely, a major record deal. They were brought together by another one of Goldberg’s clients, Thurston Moore of Sonic Youth. At their first meeting, bassist Krist Novoselic was doing much of the talking. Then Goldberg asked if they wanted to stay with the independent, Seattle-based Sub Pop Records label. “No,” Cobain said, and Goldberg knew immediately that this slight, blue-eyed man was in charge. Cobain wrote the songs, he designed the album covers, he storyboarded the videos and he wanted Nirvana to be world-famous. Goldberg did everything he could to get them there, never really knowing from one day to the next whether his role was manager, friend, father figure — or to stay out of Cobain’s business altogether. Goldberg became aware of Cobain’s drug problem in January 1992, when he returned from vacation to see two magazine pieces about Nirvana in which the writers noted that he was high. At that same time, Nirvana appeared on “Saturday Night Live” to support “Nevermind,” which had just reached No. 1 on the album charts, bumping Michael Jackson’s “Dangerous” from the top spot. Goldberg could see that Cobain was high, and scheduled an intervention with Cobain and his wife, Courtney Love. They went into treatment, and not long after, learned that Love was pregnant. Goldberg didn’t keep a notebook or diary when he was working with Nirvana. So he wrote from memory and whatever files he had. He also consulted with about 40 people, including Love and Novoselic, to fill in blanks or confirm facts. He also referred to Cobain’s own journals, which were published in 2002 and 2003. The pain came when he thought about Cobain’s addiction. The stints in rehab. The attempts at reasoning with him. Cobain wasn’t having it. He said he felt trapped by fame. He couldn’t go anywhere without being recognized. Goldberg was in a meeting when he took a call from Cobain’s lawyer, Rosemary Carroll, who was on her way to see Love, “and said she had to tell her what happened.” Goldberg had no idea what she was talking about. Goldberg compared Cobain to J.D. Salinger, and his work to “Catcher in the Rye,” a piece of art that filled a specific, generational emptiness and one in which readers saw themselves. It was the same for Nirvana’s listeners. “I think there are certain artists who tuned into a deeper place, beyond the culture of the times,” Goldberg said. “That’s true in literature and painting and that’s true in rock ‘n’ roll. Kurt was writing about things that were about more enduring human issues: feeling alienated, feeling disgusted with mass culture, redefining what it is to be a man. Goldberg is honored to be sharing the stage with Cross and Collins, “two people I respect the most,” but is nervous to be returning to Seattle. “I always felt like an outsider to the Northwestern punk scene,” Goldberg said. “It always had an enormous sense of pride, and I wasn’t part of it. “So I really appreciate that the people there want me to come,” he said. “But I have a certain amount of anxiety just because of how important the band was to the culture there, and the fact that I am not from there. Former Nirvana manager Danny Goldberg discusses his book, “Serving the Servant: Remembering Kurt Cobain,” with Charles R. Cross and Marco Collins, 7 p.m. Thursday, April 18, at the Neptune Theater, 1303 N.E. 45th St., Seattle; $36.50 (includes a copy of the book); www.stgpresents.org.